I thought I’d try something new here on the ol’ blog. I take a lot of photos. I actually take a lot of food photos that never make it here because they’re not attached to a recipe. And let’s all be honest, readers want recipes. If traffic is your game, then it’s scary to do a post without a recipe (although, to be honest, 4 of my top 10 posts of all time have no recipe). But traffic is not my game so let’s move on, shall we? I have two passions that come before food: design and photography. One I’m lucky enough to do for a living. The other is my mind numbingly frustrating hobby. lol. It’s totally frustrating – there’s a reason I compare it to golf. Have you ever tried golf?? It’s ridiculous! I totally get why people throw golf clubs or beat trees with them! 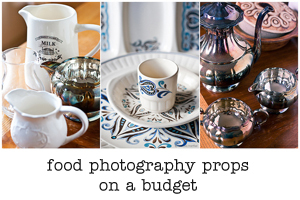 Anyhooo… I’ve been thinking about ways to make things around here a little bit more about the photography aspect of… well… food photography. I have a few things in mind but I thought what might be a fun thing to do once a week or so is a before and after photo. As in, before post processing and after. So everyone can see the progression. I’ll include the things I did in LightRoom so you can all follow along. 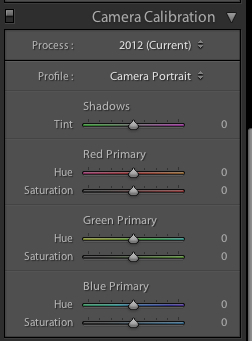 And even if you don’t use LR, a lot of the settings are similar to other post processing software. Sometimes the photos will just be quick fixes and sometimes we’ll do something a little more complex. 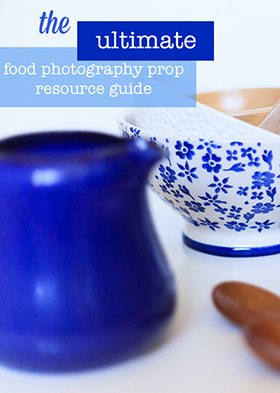 So hopefully you can learn a few tips (and pass on some of your tips to me!) and I get to use some of the photos would never otherwise get to be seen. 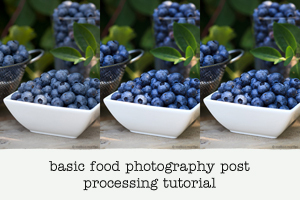 If you want a little more help with Lightroom check out my post on Basic Food Photography Processing. You might see some of it repeated here but I do go into a little more detail on some steps. This straight out of the camera with my watermark added and saved as a .jpg instead of the RAW format I shoot in. Nothing of the photo itself has been altered. Settings: f/10, 1/8 (with a tripod of course! ), ISO 100. It was taken outside facing east at about midday. I had some pretty harsh direct sunlight coming at me which I diffused with a very fancy white bedsheet that happened to be hanging out to dry on the clothesline directly to my left (south). The Depth of Field on macro lenses is a little difficult to get the hang of compared to a regular lens. 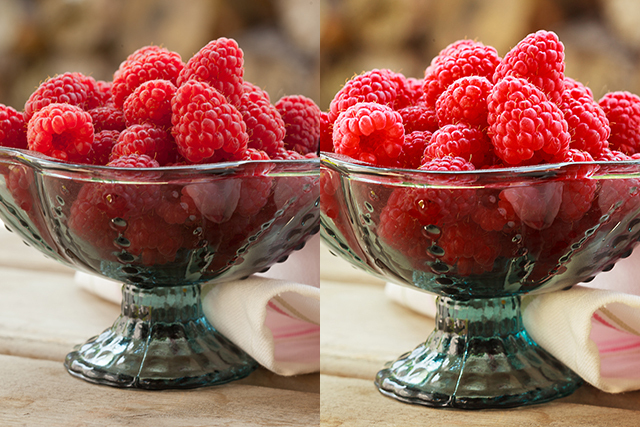 I used f/10 because I wanted all the raspberries in focus but you can see that my background is still nice and blurry. On a regular lens it all would have been well focused at f/10. The first thing I did was straighten and crop the image. I probably could have straightened it a touch more. 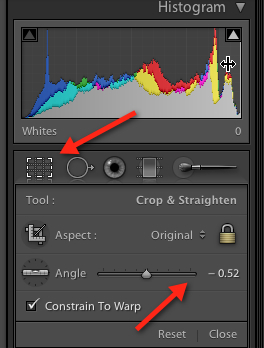 You can access the crop tool by clicking on the far left box below your histogram window (usually at the top left hand side of your Develop module). 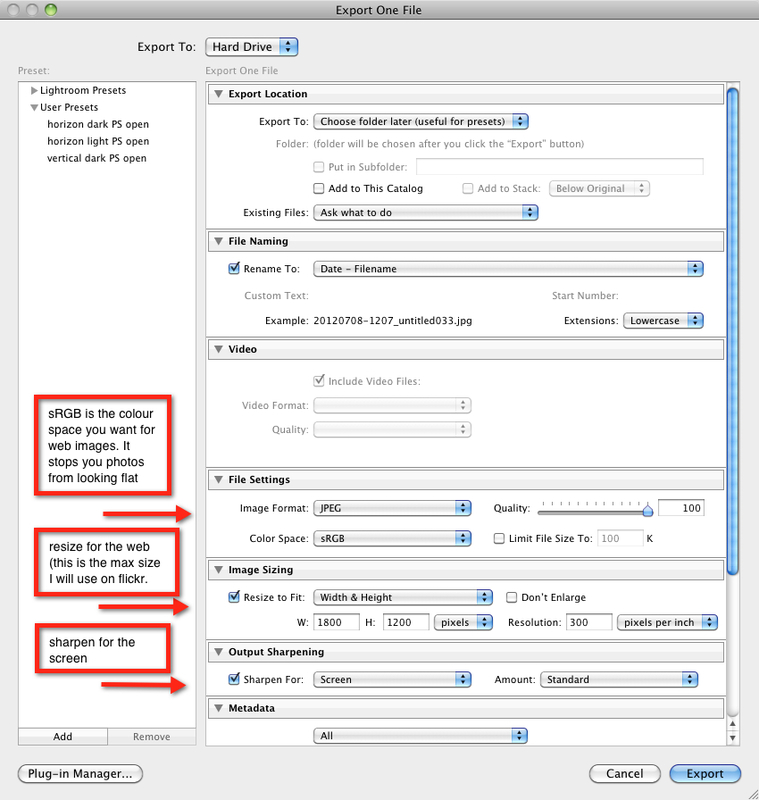 Virtually every photo editing software has a cropping tool of some kind. To straighten an image, slide the angle slider left of right. Hit Enter when you’re done. The next thing I did, which is usually the very first thing I do, was change the Camera Calibration. 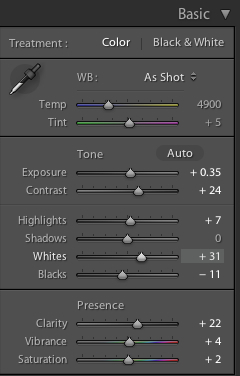 When you photograph in RAW the camera does no processing for you like it does when you shoot with .jpg. So the image that comes out of your camera using Adobe Standard, which can be very flat looking. I chose Camera Portrait for this image but cycle through the different options – each photo is different. Next I worked on fixing Basic settings. I adjusted the Exposure level by increasing it a bit – I found the image a bit too dark. This is my fault – I should have got that right in camera! Next I tweaked the contrast, highlights, vibrance, saturation and clarity settings. 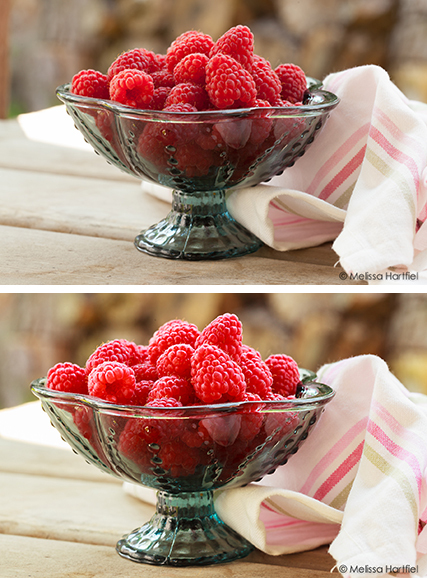 If the Whites and Highlights sliders seem a bit drastic it’s because I had some clipping happening where it’s very bright behind the raspberries – this was to bring it back in line. I was a little unhappy with the raspberries themselves so I decided to do a little dodging of just the raspberries to lighten them up. 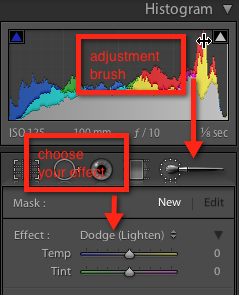 You do this in LR by clicking on the little brush icon and selecting the darkroom technique you want to use. 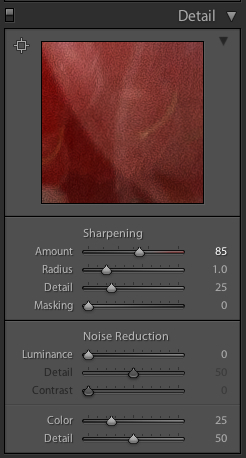 Using the brush allows you to just target a specific piece of the image instead of the whole photograph. Next I went to work on the Tone Curve, adjusting the Highlights tone a little bit which gave the image an overall brighter quality. The last thing I did was sharpen the image in Lightroom and then I exported it into a .jpg format at a size I like to use for images I’m going to put on flickr. This is also where I change the color space for web and sharpen it again for the web and add my watermark. For this image, I opened it in Photoshop afterwards and did a little additional sharpening. I rarely do this but I find for images of berries, it helps define them a bit better. All of the tweaks I did here were very small and the whole process took about 3 minutes. The only real spot touchup I did was the Dodging adjustment. I try very hard to avoid doing touchups because they take more time and precision in post processing and I’d rather be doing something else – so I do what I can to get it right when I take the photograph. You may find as you adjust one slider, you need to go back and adjust a different one. It’s a bit like taste testing a recipe as you cook it. You add one thing and realize now you need a little more of something else. The only “rules” (and they can be broken) are to change your colour calibration first and do your sharpening last! I hope this was useful to all of you. 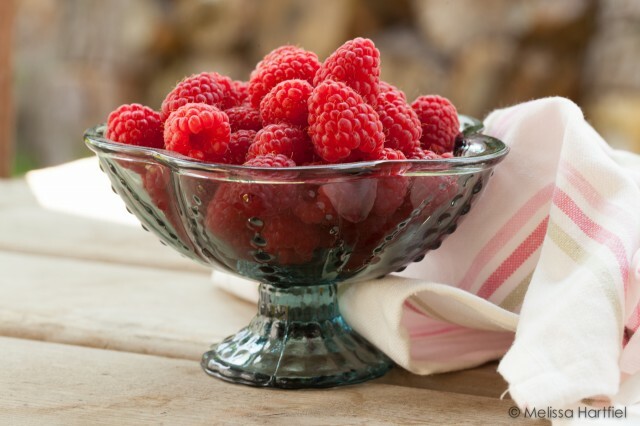 The raspberries are from my garden and they looked so pretty – I really wanted an excuse to share the photo! Next time in Before And After I’ll try to pick one specific part of post processing and go into it in more detail! Yay! This was fun! More, more! 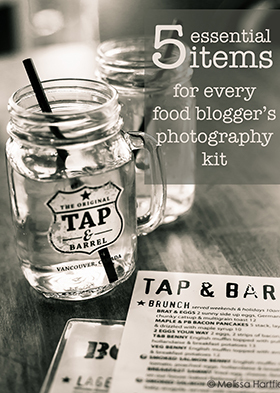 I am always looking for ways and hints to improve my photographs so I loved this post! Thank you so much for sharing. Looking forward to more like this! I must admit though, I thought the original photo was already gorgeous. Thanks Stacy. It’s always easier when the original is pretty solid. But I’ll try to pick a few in the coming weeks that need a little more help! 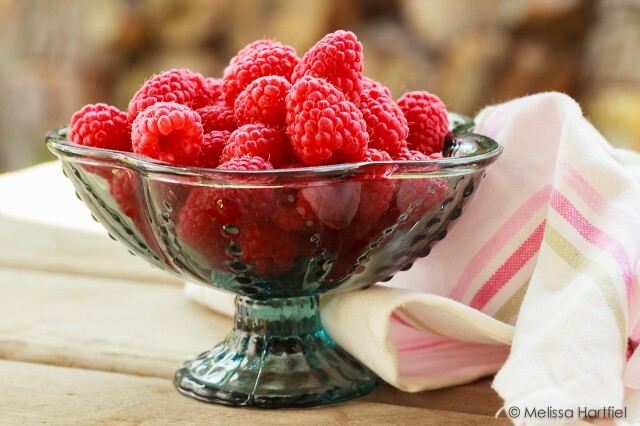 Great informative post and those berries make me want to just pluck a handful right out of the bowl. Always a pleasure to read and picked up some pointers too. Thanks so much for this post! I love seeing before and afters of other people’s photos. I really need to get an editing program for my pictures, I just have this thing that came with my first point and shoot that lets me re-size and change the contrast and that is about it! I would love to be able to straighten the pictures. This is such a good, helpful post. Thanks to your recommendation, I did end up getting Lightroom, and its made a massive difference to my post processing time. That said, you’re so right, having a good image to work with makes the process so much easier. And your first picture is pretty gorgeous. I’d love to learn more about dodging/ burning, so looking forward to more posts.